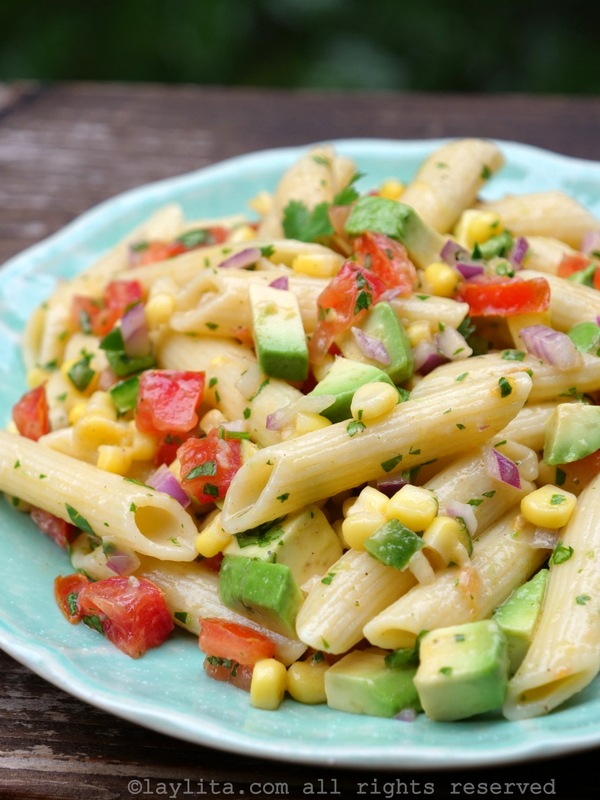 This easy corn pasta salad with tomato and avocado is one of our family’s favorites for a quick lunch. It has simple dressing made with lemon juice, mustard, and olive oil. Like most families we usually have those “crap, everyone’s hungry and what can we make quickly for lunch/dinner” moments. And like many, our answer is something with pasta. My kids love salads and as growing teenagers they are constantly hungry. I see pasta salads as a way to make sure I’m adding some vegetables and freshness to their meal, while making sure they don’t come back in 30 minutes telling me that they are still hungry. Plus, the leftovers (if any) make great school lunches. Many of the pasta salads that I make are a result of which fresh ingredients I need to use + what is available in the pantry/freezer. 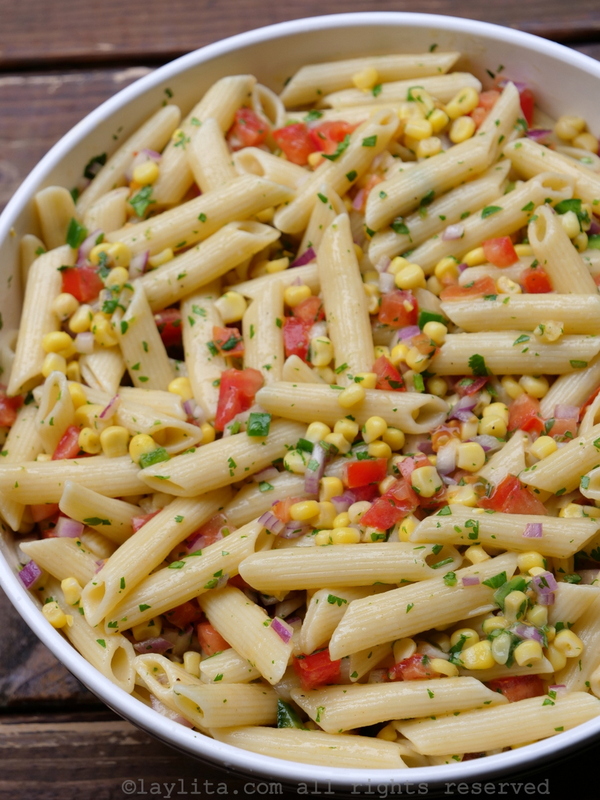 This corn pasta salad is very customizable to what you have available, or to the ingredients that you and your family like. I made this pasta salad with corn, diced tomatoes, avocado, diced red onions, a jalapeño – replace with bell pepper for the non-spicy version, cilantro, lemon juice, olive oil, and mustard. 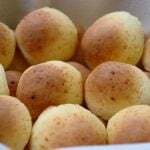 Feel free to add and replace ingredients as you wish. I boiled the corn, adding it to same pot where I was cooking the pasta during the last minutes. However, if you have time to take the corn to the next level, you can also grill or roast it. 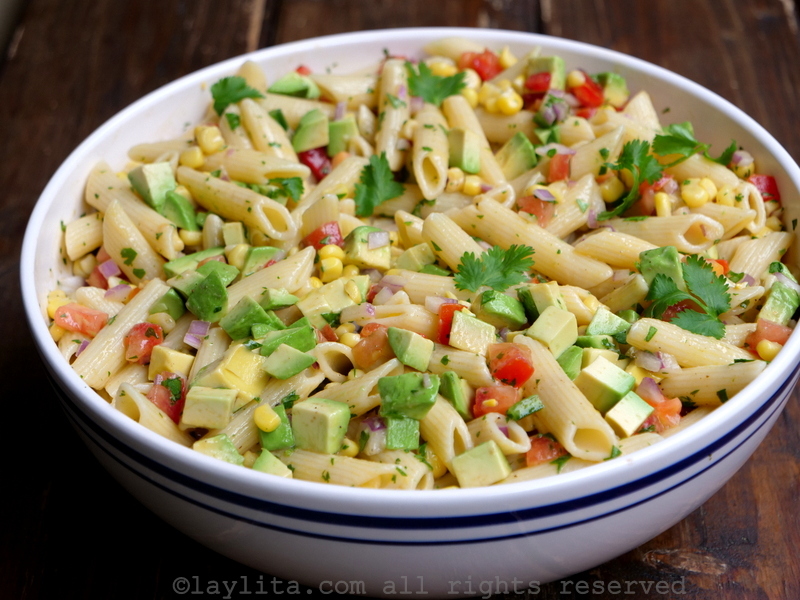 Or if you can have leftover grilled corn you can use it to make this quick pasta salad. Crumbled queso fresco or feta cheese would also be a tasty addition to this salad. 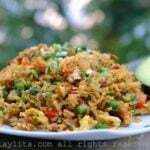 During the summer you can add leftover grilled chicken/fish/shrimp. I do like pastas salads with a mayonnaise dressing, however I usually omit the mayo if I’m adding avocado. 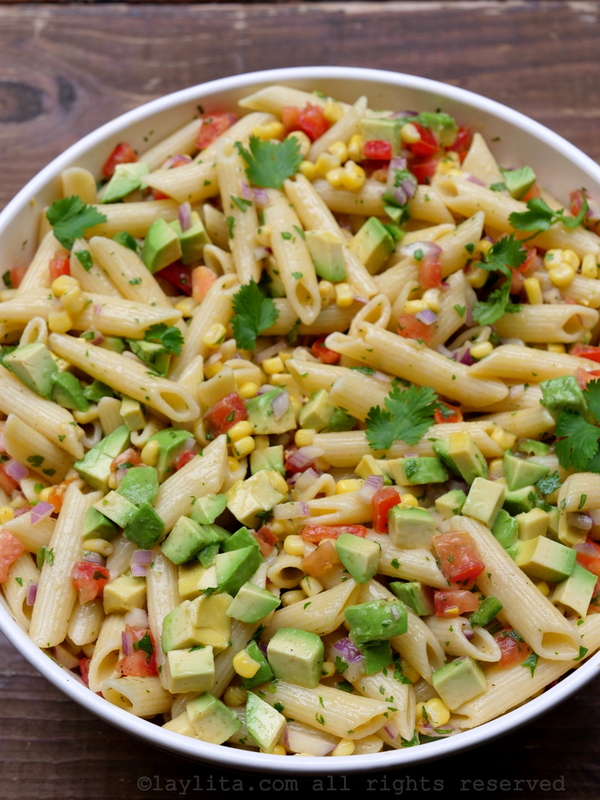 This corn pasta salad with tomato and avocado can be served the moment you make it, or you can make it ahead of time and refrigerate until ready to serve. If you do this then it’s best to add the avocado right before serving – to prevent it from darkening. If you need to take it to a picnic, potluck, or an event where it might be sitting out; you can drizzle the diced avocado with a bit of olive oil before adding it to the salad. 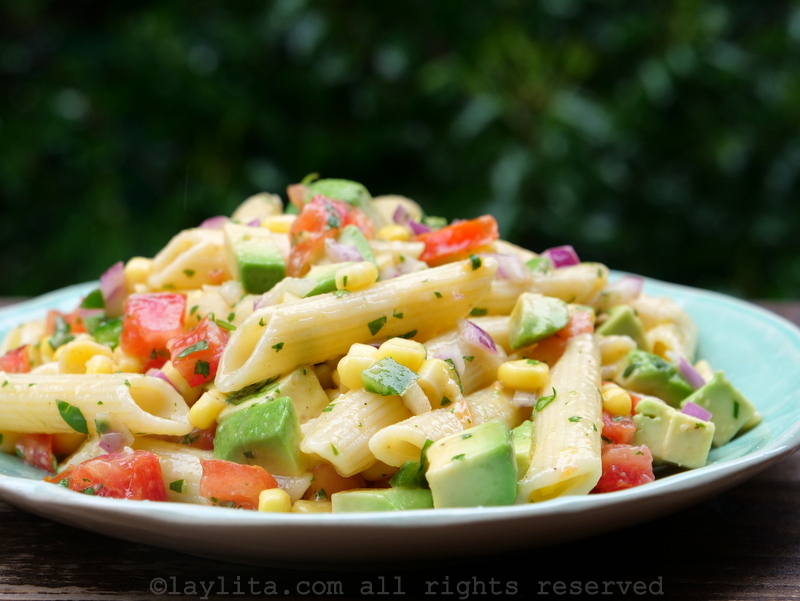 Recipe for a quick and easy corn pasta salad with tomato and avocado, with a simple lemon mustard olive dressing. This refreshing vegetable pasta salad is refreshing and delicious. Cook the pastas according to the package instructions. You can add the corn kernels during the last 4-5 minutes of cooking the pasta. Drain the pasta and the corn. Let it cool down a bit. Mix the lemon juice, mustard, olive oil, salt and pepper in a small bowl or jar. 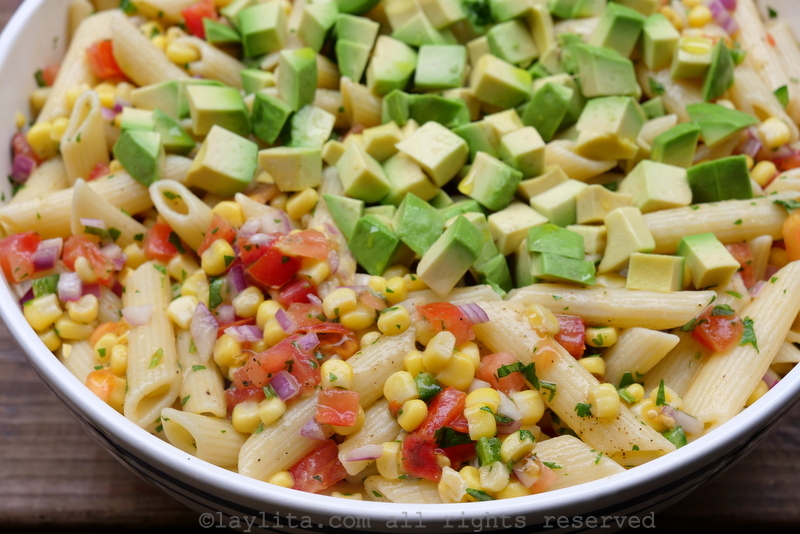 Transfer the pasta and corn to a large salad bowl. Add the diced tomatoes, diced red onions, diced hot or sweet peppers, and chopped cilantro. If serving immediately add in the avocado. 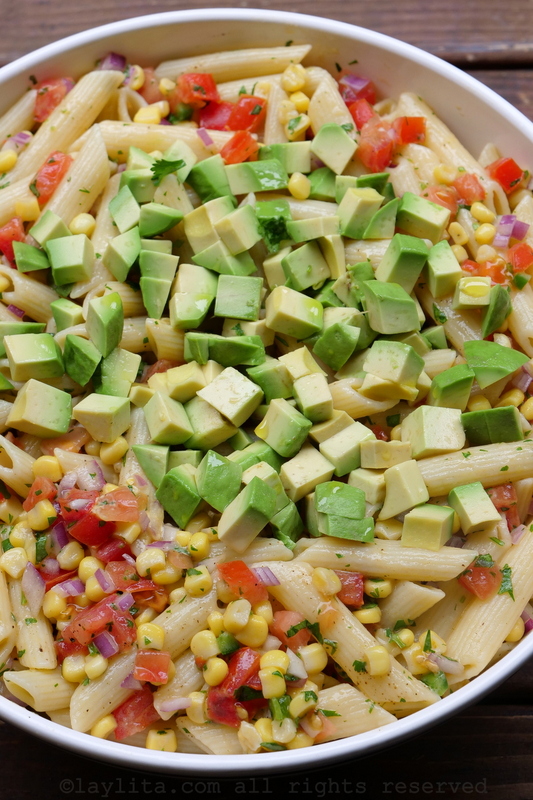 If not refrigerate the corn pasta salad and mix in the avocado right before serving.